In response to last weeks field trip I attempted to make my own location based narrative in the form of a visualization. I have recently been interested in data visualizations and have begun to teach myself d3.js. I saw an opportunity with this assignment to implement a mapped data visualization to tell a story. Initially, I wanted to create a website with the map of the neighborhood that I grew up in. I would then populated key points on that map with stories about my life that happened in locations on the map. Once I began to play around with d3.js I realized that customizing a detailed street map in d3.js was a little too involved for a first attempt at a mapping data visualization. Thus, I altered my idea in order to accommodate my beginner d3.js skills. Ultimately, I decided to use a data set about the Woman’s March in 2017 to show the scale of the event. 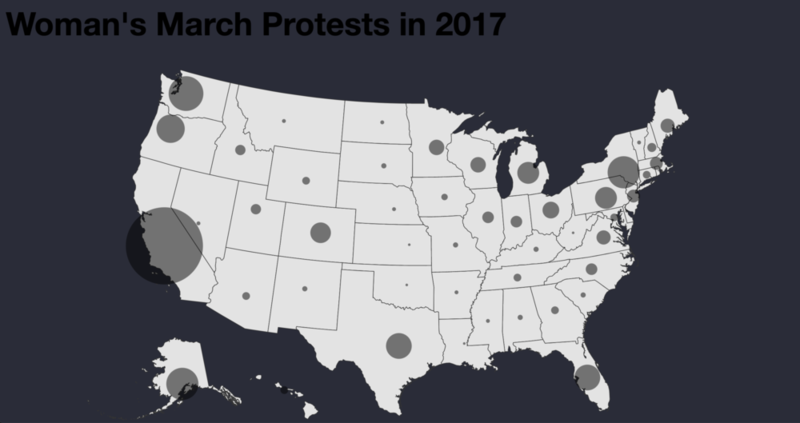 Using the data from this wikipedia page I created a csv file with the state names and the approximate number of cities that hosted protests and the approximate number of people in each state that attended the protests. With d3.js I developed this website (Figure 1). The size of each circle represents the amount of protests that occurred in that state. When you mouse over each circle you are given more information about the protests in that state. Figure 2 shows a demo of the website. While I am glad that I used this opportunity to use some d3.js skills I do not think that this narrative is as in depth as it could have been. I think that I let the technical side of this project get in the way of the actual meaning. Since the technical side took so long to decipher by the time I incorporated data to tell the story, I was burnt out. In the future I would really like to go back to the idea of the narrative about my life. I see how that could be a fun way to show people stories about how I am and where I came from. I even think it could be something like to embed into the “About Me” section of my website. For the project files go to this link.